Quickee Adjustable Pushrods for 1999-'15 big twins w/ stock engine height +/- .050"
Fitment:1999-'16 HD® Twin Cam 96™ with stock engine height. 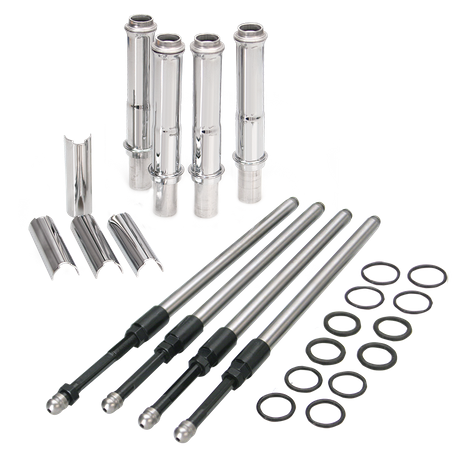 Everything you need to convert a HD® Twin Cam 88® or Twin Cam 96™ to adjustable pushrods. Quickee kit will accommodate all displacements. Kit includes: Quickee pushrod kit, Chrome pushrod covers, O-rings and Cover keepers. These are fantastic to avoid a little extra work when doing upgrades to your engine. I would however like to say that you should speak with someone who has used them before. The instructions call for 4 complete turns to adjust. This ended up causing problems with my bike. I re did the adjustment at 3.5 complete turns and it is running like a dream. Have done 4 more bikes since then and used the 3.5 turns and it's perfect every time.